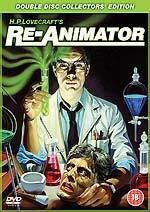 Anchor Bay UK will release Stuart Gordon's Grand Guignol masterpiece Re-Animator as a Double Disc Collector's Edition DVD on April the 23rd. The set will present a "fully restored" version of the film, offering the uncut, "definitive version" of the 1985, which will include material previously excised by the BBFC (including the film's notorious "head" sequence). The disc will be presented in anamorphic 1.85:1 format, with a choice of 5.1 or 2.0 audio tracks. Extras, straight from the press release: audio commentary by director Stuart Gordon; audio commentary by producer Brian Yuzna and stars Bruce Abbott, Jeffrey Combs, Barbara Crampton and Robert Sampson; 70-minute featurette - Re-Animator Resurrectus; interview with director Stuart Gordon and producer Brian Yuzna; interview with writer Dennis Paoli; interview with composer Richard Band; Music Discussion with composer Richard Band; interview with Fangoria editor Tony Timpone; deleted scene; extended scenes; trailer; TV Spots; production stills gallery; behind-the-scenes stills gallery; Fun On The Set stills gallery; posters and advertising gallery; storyboard gallery; Stuart Gordon biography; screenplay (DVD-Rom); Herbert West, Reanimator by H.P. Lovecraft (DVD-Rom). The RRP is £16.99. HMV's exclusive version comes with an alternate artwork slipcase, and a syringe-style highlighter pen! There's a good reason that there's not much by way of news here today, and that's because I spent several hours last night adding new titles, additional details, and more links to the Incoming database. There will be another News update mid-week.